This recipe transforms simple skirt steak into tender delicious morsels of meaty goodness. I also do the same recipe and serve it with chimmichurri, black beans and rice, plantains and salad, but that is for another day and this recipe is a celebration of the perfect vessel of flavor: El Taco. The aroma of warm corn tortillas is enough to get me excited, but wait til you try the marinade and its accoutrements. I put a lot of fire in my taco construction, it can obviously be dialed down, but for the true chile lover, this is the greatest expression of their being. This recipe calls for dried whole chiles, fresh chiles and of course, Melinda’s Hot Sauce. All in all, five diiferent chiles working together form this masterpiece: Dried Ancho, Dried Guajillo, fresh serranos or jalapeños and fresh habanero chiles. Please see my tips for handling habaneros or you will be sorry. I have also suggested alternatives ingredients to make this entire recipe Paleo/whole30 approved. Now, let’s get to the Carne Asada Tacos. This recipe transforms simple skirt steak into tender delicious morsels of meaty goodness. I have included hacks so that it can be made Paleo and Whole30 approved! There is nothing worse than spending all this time on a perfect taco and then it’s cold! Follow these preparation steps so everything is ready when your meat is hot off the grill. 2. Trim silver skin and excess fat from meat, then coat meat in marinade and place in the refrigerator. 4. Chop your cilantro and onions, you want more cilantro than onions 75/25 mixture, refrigerate. 5. Slice your serranos or jalapeños in half, remove stems and seed. Use your glove, fork and knife. Lightly brush the chiles and scallions with olive oil and place them in a pan. You will grill these right after the meat. Keep your tortillas warm by wrapping them in a towel and placing them into an insulated container. There are special containers made for this or you can use an ice bucket or ice chest. I’ve even seen people use their crock pots. I can make fresh tortillas but I have an amazing Tienda near me run by a Guatemalan family, the mother makes fresh corn tortillas just like my mother! So, I just buy those. Remove stems and seeds from your dried chile pods. If you can’t find these pods, use ground chiles instead. (TIP) If you don’t find these in your grocery store, your local Latino store or tienda sells these, along with homemade tortillas and other goodies. In a large skillet, toast chilies, allspice, cumin and coriander seeds for a few minutes until they become aromatic. Place chilies in a food processor or blender, I actually prefer a Nutri-Bullet for this but any will work. Grind your toasted spices in a spice grinder or use a mortar and pestle. If you don’t have the seeds just use pre-ground spices. Add the spices to the blender with garlic, orange juice, lime juice, cilantro, soy sauce, Worcestershire, Pickapeppa, fish sauce, olive oil, sugar, kosher salt and pepper. (see alternate ingredients for whole30/Paleo if you are following those diets/lifestyles), Liquify your marinade! Coat your steak with the marinade and place in a large zipper bag for no less than one hour and up to 12 hours. (TIP) Anything longer and you will breakdown the connective tissue too much and the result will be mushy meat. The perfect time is between 4 and 8 hours. Heat your grill, preferable hardwood lump charcoal and a lot of it. You want a very intense fire. The faster and more furiously you cook the skirt steak, the more charred it will be on the outside and pink on the inside. When your heat source is blazing, wipe off excess marinade and place meat on direct heat for 2 to 4 minutes per side (some cooks will blow the ashes off their coals and place the meat directly into the fire for 1 to 2 mins per side).Remove the meat and place it ona sheet pan and tent with foil. Place in the oven on warm (175 degrees). While meat is resting (5 minutes) grill your serranos or jalapeños and scallions until they have a nice char. 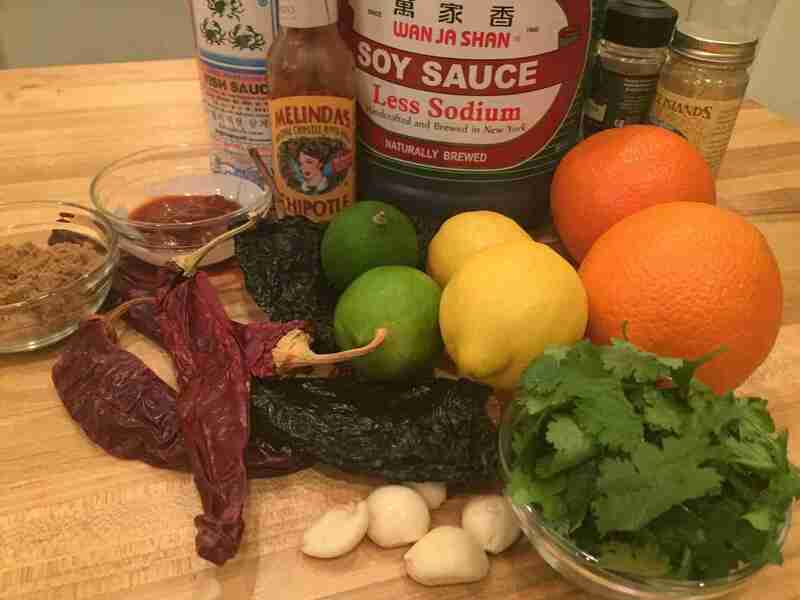 Chop them together to make yet another amazing taco topping. 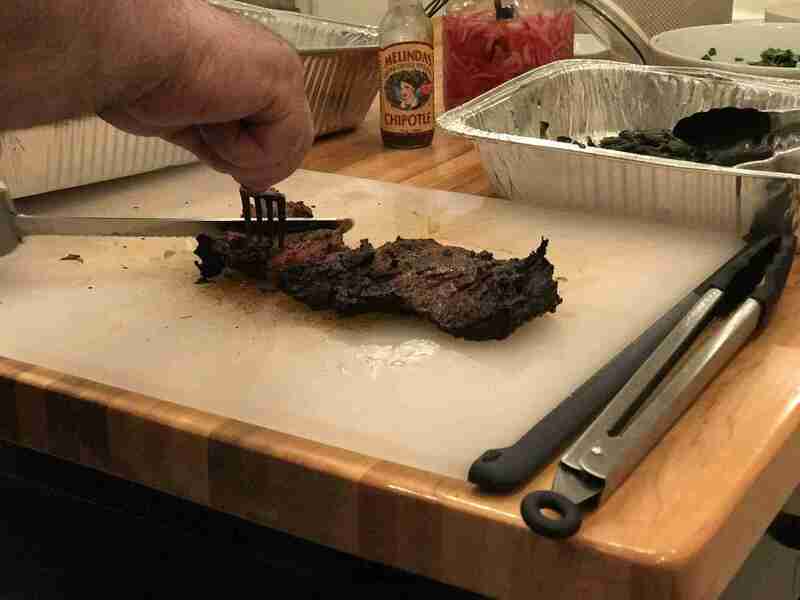 Slice your steak thinly against the grain and serve immediately! (TIP) I like to break out the electric knife for this to save time and effort. Because you prepped all the accoutrements you are ready to build the most deliciously meaty carne asada tacos you ever had. My favorite method is tortilla, meat, scallions and serranos, cilantro and onions, a sprinkle of queso fresco and a few pickled red onions.